Lake Huron is the second largest Great Lake by surface area, the third largest by volume. By comparison, it is 3 times larger than Lake Ontario. It has the most extensive shoreline of all of the lakes (over 4 times that of Lake Erie and over 5 times that of Lake Ontario). This is a BIG lake! Most commonly, it is said to have been named after the aboriginal peoples who lived along its shores. However, these people referred to themselves as 'Wendat'. It has been suggested that the name actually derives from the Old French word 'hure' meaning a shock of hair or, as we know it, a mohawk-style haircut or headdress. Another name that connects Lake Huron with the early French explorers is 'la mer douce' or the Sweetwater Sea. This description was given to Samuel de Champlain, the founder of Quebec by Etienne Brule, the youth who went on to become the first European to set eyes on each of the Great Lakes. 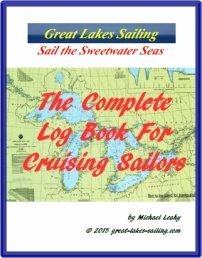 The term has since come to refer to the entire Great Lakes and is one that we here at Great-Lakes-Sailing.com happily embrace! On the east side of the lake lies Georgian Bay. This huge bay is about 80% of the size of Lake Ontario. Dotted with tens of thousands of small islands (collectively known as the 30,000 islands), Georgian Bay is a delight to a cruising sailor. At the northwest corner of Georgian Bay lies Manitoulin Island, the largest freshwater island in the world. This hidden gem offers a spectacular, untouched landscape, over 100 small, pristine lakes and superb fishing for the angler. The North Channel lies between Manitoulin Island and the north coast of Lake Huron. It is recognized as the finest freshwater cruising ground in the world and one of the top overall cruising grounds world wide. It offers unparallelled beauty as you sail its 160 nm length. To the southwest lies another large bay – Saginaw Bay. It too offers an extensive cruising ground with over 1,100 sq mi / 2,900 sq km of surface area and over 150 nm of coastline. All-in-all, a lot of water and many many places to explore! Lake Huron is bounded by the province of Ontario and state of Michigan. Its coastline is far more rugged than its southern neighbours, especially the further north you go. Harbours are about evenly split with more or less three dozen on either the Canadian or American sides of the lake. The character of the coastline is rural extending well up the lake. The Saginaw Bay region is intensively farmed as is the southeast Canadian shoreline. However, as you go north of the Bruce peninsula, you begin to see another side to the complex character of both Lake Huron and the Great Lakes. The population becomes noticeably thinner, the landscape much more rugged and the scenery increasingly more stunning. Small towns and communities replace large cities. A resource-based economy centred on forestry and mining edges out farming and manufacturing. But, for the cruising sailor, the rewards are huge! Imagine exploring countless thousands of small islands and inlets or heading deeper up Baie Fine – one of the largest freshwater fjords in the world. A sailing paradise awaits you. Check out these ports and harbors in the following port reviews and set your course for adventure.